Head lice, or pediculosis, is a condition where tiny parasites live within the hair on your scalp. It is hard to see head lice within the thick of your hair, but they are usually visible near the ears, neck and shoulders. Unfortunately, head lice infestation in school-aged children is an incredibly common occurrence requiring parents to go on a search for an effective head lice treatment. 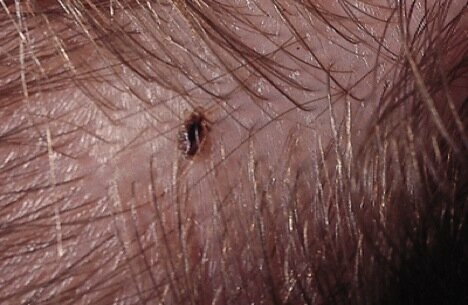 Head lice bite on your head and drink the tiny droplets of blood that they create. This leads to itchiness and a desire to scratch the affected area. Their eggs, or nits, are as small as a flake of dandruff. Very soon these nits will hatch into even more head lice. It is very easy to pass head lice from one person to the other. Lots of people think that somebody who has head lice has poor hygiene, but this is a false belief. Anyone can get head lice, regardless of how often they shower or how well they take care of their body. Kids between the ages of three and 12 are the most likely to get them, and then they pass them along to their families. The reason girls are more likely to get head lice is because their hair is longer and offers more protection. It is important to find a good head lice treatment and address the nit infestation right away so they do not cause an infection. 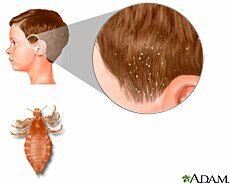 Head Lice and their nits are very contagious and are usually passed along from one person to the next. This is one of the reasons that kids get head lice so easily; when they play their heads often come into contact with each other. Sharing things like combs, clothing, pillows, towels and hairbands are also an easy way to spread head lice nits. There are plenty of ways to get rid of lice. You can buy shampoos and lotions OTC (Over The Counter) at the drugstore. These types of products usually come with a comb that is specially designed to sweep away the head lice and nits. Be careful because these types of products to get rid of lice are harsh because they are actually insecticides. Make sure you take a close look at what the base is. They are usually either water or alcohol. If you have a skin condition or have allergies then you should try the water-based type of head lice treatment. If you are wary of using strong chemicals on your child's head then you can try herbs to get rid of lice. Neem, Rosemary and Lavender are all good at driving off the head lice, reducing inflammation and keeping the area free of germs and other intruders. Tea Tree Oil is also good to use and can be found in many different types of natural shampoos. One last herb that you can try for head lice symptoms is Rose Geranium which has been shown to prevent another infestation and help to get the sticky nits loose from their locations. Make sure that you check the rest of the family and quickly change all bedding should a nit infestation break out. It is very easy for an entire family to become infected with these tiny pests. Often times, everyone in the family ends up with them! Massage the entire formula vigorously into the hair and scalp before bedtime. Wrap a towel around the head, and leave it on overnight. Repeat nightly until the lice are gone. 27 Drops Equal Proportion of each Essential oil. Note: I have use it with grape seed oil too. You can use this on people and Animals. Lice, Fleas, & Ticks don't like Lavender, Lemon, Tea Tree & Eucalyptus. I bathe my dog in Lemon, Lavender, & Apple Vinegar. You just put a couple drops of each in the water. According to the CDC, After each treatment, checking the hair and combing with a nit comb to remove nits and lice every 2–3 days may decrease the chance of self–reinfestation. Continue to check for 2–3 weeks to be sure all lice and nits are gone. If your child has fallen victim to the horrid plight of head lice, kill those follicle munchers and their eggs fast with Head Hunters Pro-Lice Treatment. In the world of elementary school politics, no kid wants to be singled out as the one with little bugs in their hair. These two salon-grade products work together to eradicate an active head lice infestation. WipeOut is a revolutionary treatment option for head lice because it destroys a louse from the inside out by causing a physical reaction instead of a chemical reaction. WipeOut utilizes ingredients that destroy Super Lice without harming the individual. Since a louse can sense moisture and shut down its orifices, WipeOut is designed to keep those orifices open to kill the louse from the inside. When paired with the Head Hunters Pro-Lice Comb, WipeOut works with just one application. After applying WipeOut, the Pro-Lice Comb removes deceased lice and their nits with steel, micro-grooved teeth. WipeOut is a professional product that will eliminate even the most difficult case of head lice. All of Head Hunters Naturals' products are all-natural and chemical-free for your safety. Learn more about Head Hunters Pro-Lice Treatment.